Remember you can use the UKCS uploader to store your pics here. Get the ball rolling. 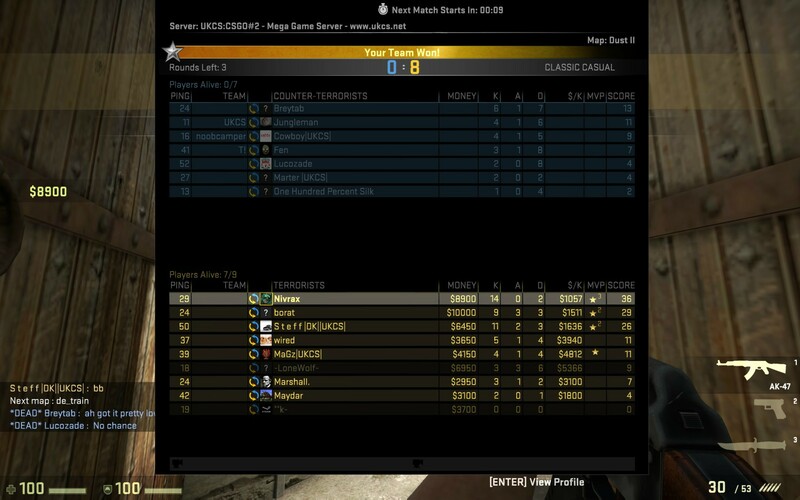 Was awful at CSS even tho played for many years, been playing better on GO. Even though I did this months ago, I still think it is worth a showing. What happens when the entire enemy team all decide the best course of action is to climb a ladder? When I'm back in the UK I will show you ladies how it's done. I cant see a damn thing on this super small monitor im stuck with atm. cause my other one died. But it seems to do the job, for now. Ohh, so your Nivrax Well played! Was 28-2 but then i messed it up AUG2stronk! some nice scores, can't really compete with those, but here's my "better" play. but, atleast i still know how to knife, plant a bomb, and win the round as mvp. Yes ... Swooping is bad.